A mass funeral was held on Friday in Salerno, Italy for 26 young Nigerian women who drowned while trying to cross the Mediterranean Sea. A simple ceremony was held in the city with 26 wooden coffins with a single white rose places on each lid. A Roman Catholic bishop and Muslim imam both said prayers at the ceremony. 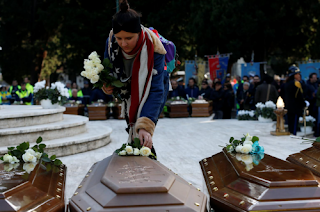 The bodies of the 26 victims were retrieved from the Mediterranean Sea on Nov. 3 by a Spanish rescue ship. Those who died were believed to be as young as 14. 64 people are still unaccounted for and feared lost, bringing the total dead to around 90. Libyan authorities are working with the Italian government to block migrants from leaving Libya, leading to a sharp fall from the summer. 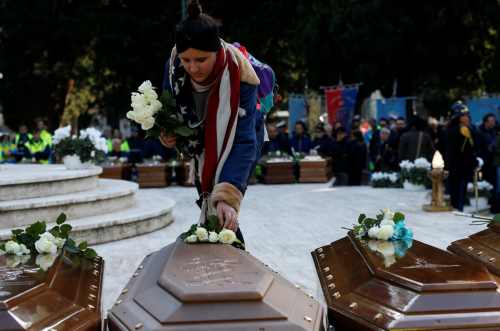 The Italian government says its policy has cut the number of sea deaths, however, critics say it has left thousands of refugees and migrants trapped in terrible conditions in Libya.